The Peter Schrager Podcast hosts Charles Davis and Daniel Jeremiah. The NFL Draft may be five months away, but it was a hot talking point on this week’s two-part series of The Peter Schrager Podcast. Is Teddy Bridgewater the first QB off the board? Bridgewater’s mental and physical toughness make him a unique prospect, but he could be overvalued because of the need for quarterbacks. While Bridgewater isn’t in the same class of Cam Newton or Andrew Luck, he will likely be the first QB off the board, and his skills will translate to the next level better than any other QB prospect from 2013. Davis compares Bridgewater to Seattle Seahawks quarterback Russell Wilson with a taller build and less mobility. Would the Texans draft Derek Carr? David Carr was Houston’s first draft pick in their inaugural season. Could history repeat itself? Don’t count on it. 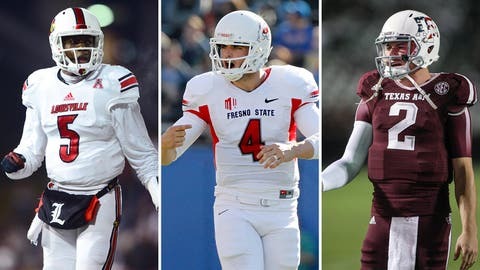 While the Fresno State quarterback has dazzled scouts with his arm strength and athleticism, the Texans’ fan base would lose itself if the team made the move. Would you draft Johnny Manziel? When it comes to instincts and playmaking ability, Jeremiah says he hasn’t scouted a better player at the quarterback position than Manziel. That’s not to say that there won’t be any concerns. Although he won’t likely be asked to run quite as much as he has, people will wonder about his size and durability. Is he the same quarterback when he’s banged up? That’s up for discussion. Let’s talk some young NFL quarterbacks. Cam Newton has elevated his play in Year 3, but needs to lead his team in the postseason. The verdict is still out on a handful of other QBs including Christian Ponder, Jake Locker, Blaine Gabbert and Mike Glennon. Which of that crop has a bright future in the league? Davis also notes that Glennon doesn’t have a big huddle presence and attributes that to the no-huddle offense in college. Is Nick Foles the long-term answer for Chip Kelly? Although the second-year quarterback has been playing at an elite level this season, does he fit the Eagles head coach’s system? Both panelists believe he does because Kelly does such a great job at adapting his offense to his player’s unique skill set. Foles has proven to be a phenomenal decision-maker, and that will continue to help him play at a high level. The South Carolina defensive end has had his eye on the NFL for some time, but has that caused his stock to dip? Looking for the next Jimmy Graham or Rob Gronkowski? North Carolina tight end Eric Ebron could be that guy.